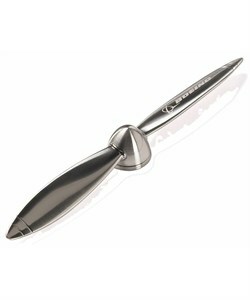 Put a new spin on opening the bills with this propeller letter opener. With its streamlined design of heavy zinc alloy and brushed-metal finish, it makes a beautiful objet d'art for the desktop. Twirl it on its spinning metal base for a bit of fun.